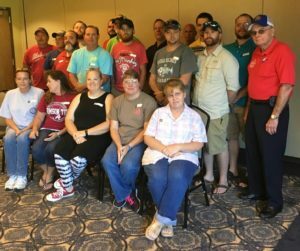 On August 5, the International Chemical Workers Union Council (ICWUC) of the UFCW held an officer training and steward class in Scottsboro, Ala., for 21 officers and stewards at UFCW Local 504T. The UFCW Local 504T officers and stewards are employed at Lozier Corporation in Scottsboro, and work in the maintenance, production and warehouse divisions producing metal and wood shelves and their braces. UFCW Local 504T’s current contract with Lozier Corporation covers 325 members. Participants learned about the duties of officers and shop stewards, as well as the duties of the organizing and safety committees. The training session also provided participants with an overview of health and safety issues officers and stewards may face in the workplace. The training session was hosted by UFCW Local 504T, and ICWUC Secretary-Treasurer and Regional Director Neal Dillard and ICWUC Recorder Chuck Denny served as the instructors.